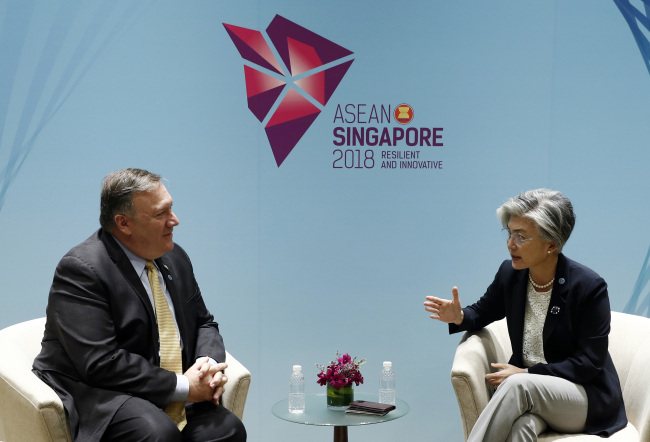 South Korean Foreign Minister Kang Kyung-wha and her US counterpart Mike Pompeo vowed close coordination to resolve North Korea’s nuclear standoff during a bilateral meeting on the sidelines of a regional security forum in Singapore on Saturday. Kang and Pompeo, both attending the Association of Southeast Asian Nations Regional Forum that began Thursday, had the one-on-one meeting Saturday morning on the sidelines to exchange views on matters regarding North Korea and other areas of mutual concern. South Korea and the US are engaging North Korea in negotiations to follow up on the reclusive country’s commitment to denuclearization amid a lack of progress in efforts to denuclearize North Korea and reports of relaxed enforcement of sanctions on the North. In the closed-door meeting, they pledged close coordination to implement the Panmunjom Declaration, made at the April 27 inter-Korean summit, and the Sentosa joint statement, released at the US-North Korea summit in June, despite the difficulties in resolving the North Korean nuclear issue, according to a diplomatic source. At both summits, North Korea committed to the complete denuclearization of the Korean Peninsula. The two countries were also said to have delivered their own positions on their ongoing negotiations on the sharing of the cost for the stationing of the US Forces Korea, sanctions and trade on Iran, and imports and exports of South Korean cars. During the meeting, Pompeo and Kang broadly touched on the issue of declaring an end to the Korean War, but not specifically about the timing, according to an official from Seoul‘s Foreign Ministry on condition of anonymity. Talks between North Korea and the US appear to be deadlocked, as North Korea wants the US to declare an end to the Korean War as the first step to guaranteeing its regime security but the US wants the North to take more concrete steps to denuclearize first. South Korea also backs the declaration within the year as agreed at the April 27 inter-Korean summit. Recent reports of North Korea‘s continued evasion of UN sanctions through increased illegal ship-to-ship transfers at sea and continued missile production has further intensified skepticism over the North’s willingness to denuclearize despite the communist state’s recent repatriation of the remains of the US soldiers killed during the Korean War. Still, Pompeo said he looked forward to seeing progress on North Korea’s denuclearization through follow-up negotiations and that sanctions on North Korea should remain in place to achieve such a goal, the official said. Kang also agreed that sanctions should be enforced until North Korea takes “concrete” and “meaningful” steps to denuclearize, according to the official. Later in the day, Kang and Pompeo attended meeting of top diplomats from the 26 countries and the European Union in the afternoon, where the countries will adopt a joint statement. Led by the 10 members of the Association of Southeast Asian Nations, the ASEAN Regional Forum is running until today, bringing together key countries in the Korean Peninsula’s denuclearization efforts. It is one of the largest gatherings in the region to discuss security issues in the Asia-Pacific region. In recent years it has served as a rare venue for North Korea to interact with other countries.